Tips for First-Time Travellers There’s no denying that travelling to India can be a major culture shock, especially on your first visit. It’s a huge and bewildering country, with many different religions and cultures, and cities that roar with traffic and bustle with activity non-stop. So how to prepare for this assault on the senses? At Rough Guides we reckon that if you want to get the most out of your trip it’s best to follow these essential rules. cloths & skin care Carry all your essentials in the bag, but try keeping it lighter. Wear cotton clothes in summer, avoiding synthetic ones as they will keep you breathless. Wear sun glasses in summers, sweaters & light jackets in winters and rain coat & umbrellas in rainy season. Sun screen lotions to be must in your bag. Also carry a sewing kit, pocket knife, torch, spare batteries, neck pillow, eye patches and a good first aid kit. Carrying delicate fabrics is not a good option if you are staying in a budget class hotel. travelling tips Carry your passport, traveler's cheques, money, cards etc. in an inner shirt/jeans pocket. Better still; shove them in a hidden money belt against your skin. You can then dance around pickpockets and yet be safe. The worst thing to do is to carry them in a zippy bag hung over the shoulders. You will never know when someone just slips it out. The fanny bags or waist packs spell 'money' to pickpockets and make you an easy prey to swoop on. You cannot escape their nimble fingers and sharp razors. 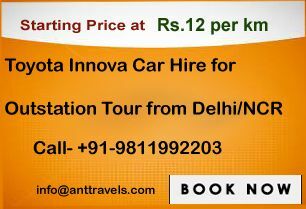 You can travel through many modes of transport available- cycle rickshaws, Tongas, buses, trains, cars, planes but always confirm the rate to be charged or ask them the fare conversion tariff card. Never buy rail/air tickets and hotel rooms through touts, they maigh cheat you. Always go to a Approved Travel Agent. Get you domestic tickets and hotel room booked well in advance as in the peak season there is a great rush, so you may not face any discomfort later. Beware of pickpockets at crowded haunts like airports, railway station, markets and tourist spots. language Most parts of India, use local language to speak, but you need not to worry English is now a days commonly spoken and understood language in cities and towns. Here are some phrases and words which you should learn before as you will come across many times. 1 - My name is Peter -> Mera naam Peter hai 2 - Where can I get.? -> Kahan Milega...? religion & temple Religion is a sensitive topic for most Indians. It is nice to keep your rational / logical self under wraps and follow the harmless norms. Just be sober and friendly in any holy place and remember some must-dos that should keep everyone happy. Remove your shoes, sandals, sneakers, slippers etc. This is done to keep God's place clean. If you hate walking barefoot and are lucky enough, there might be a cloth overshoe provided to you. Also, wash your hands and feet, if you please - it isn't compulsory but just another sign of reverence to the deity. Alcohol is a strict no-no inside the temples. An Indian attire like a Sari, salwar-suit is ideal while visiting a temple. A loose blouse and a long skirt can do too. Covering your head before entering a Sikh Gurudwara or a mosque will be appreciated. Since most Hindu and Jains are veggies, it isn't surprising that leather products like shoes, belts, handbags, camera cases etc. are prohibited. Do not point your feet and back towards the Holy Book / the idol / altar. In a Hindu or Sikh temple, sit cross-legged or tuck your feet away. health While traveling take all precautions that will keep you from that running nose (or tummy ! ), dizzy body temperatures, giddy hangovers etc. Make sure you carry the first aid kit with all the medicines. If you believe in taking precautions, take all the vaccinations one needs. To avoid malaria and dengue, carry mosquito repellents, nets and sprays. If you can bear the heat, wear clothes that cover most of the body. Be extra careful about food and water. Eating raw salads and fried food from a street-side vendor is a no-no. Avoid pork too. If the temptation is soaring, go to a clean restaurant that you can trust. Eat balanced and healthy meals. Keep popping those friendly multi-vitamins. Water has to be from a reliably clean source. If not sure where the water comes from, ask for a known brand of mineral water. Always carry a water bottle with you - this will save you from dehydration too.